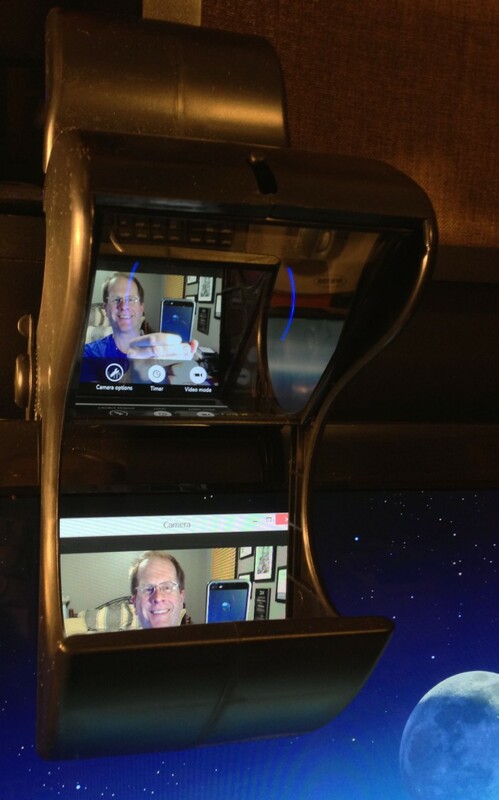 SeeEye2Eye first look, a webcam eye contact device for Google+ Hangouts? Read more about the device at bodelin.com/se2e, and if you decide to purchase one, here's the See Eye 2 Eye on Amazon, for $49.99 USD. I'll post more information right here, once I've spent a bit more time with it. Here's a picture that'll give you a sense of how it works, with a half-silvered mirror paired with a full-silvered mirror, positioned at 45 degree angles from the screen. It bounces the image from the top center of your monitor up and over your webcam, so the experience for me is looking at the person I'm chatting with, right in the eye. Nice! Doesn't scratch the monitor, with a little foam rubber covering the plastic enclosure that both clips over the top of the monitor holding most of the wait, with the rest of the assembly swinging down to rest gently on the face of the monitor. Had to make sure my Logitech C920's "On the air" blue lights were covered to avoid some minor reflections, or alternatively turn them off in software. 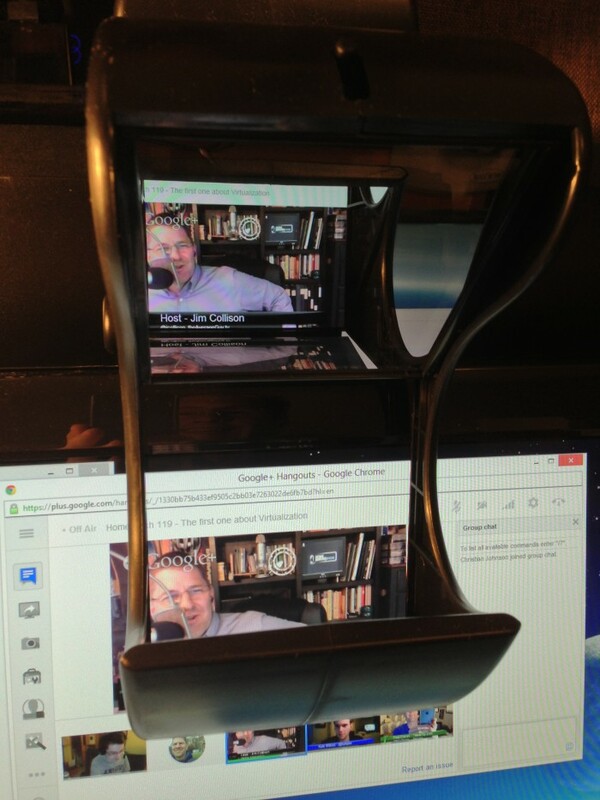 But otherwise set up was straight forward, resizing the Google+ Hangout windows appropriately. One somewhat strange thing that is specific to Google+ Hangouts is the speaker is automatically shown in the larger window. This means when I spoke during the podcast, I'd find I'm looking myself straight in the eye. Intead I wanted to look at the other person I'm talking to in the eye. So I simply clicked the thumbnail of the appropriate person to override the default autoswitching to speaker behavior to work around this. Not a big deal, and wouldn't be an issue with 1:1 video calls over Skype, for example. The biggest drawback is the small size. 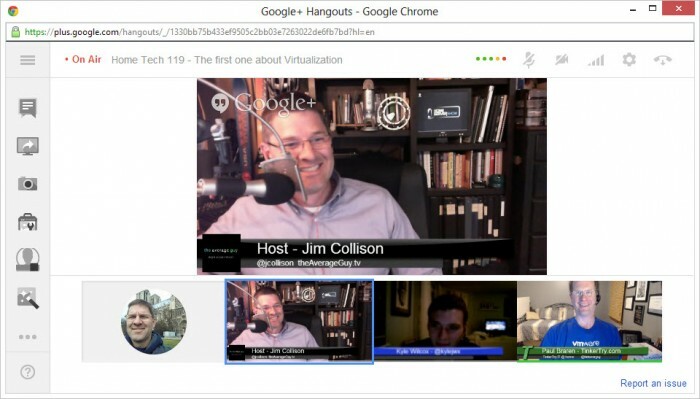 Using this on a 2560x1440 27" monitor, I had to resize my Google+ Hangout window to a somewhat small 960x547 pixel portion of the monitor, to allow me to see both who I'm talking to, and the thumbnail views of the other folks in the Hangout. The actual window size used during this Google+ Hangout/Podcast is pictured below. Still worthwhile for my needs? Yes! But like other reviewers on the Amazon, I'd prefer a larger version, should one become available. To prevent that blue "recording" light scatter from a mild reflection seen to others in the lower corners, you can disable in software on the Logitech C920, seen in screenshot below.